02/03/16 Update: Further investigations by fans have demonstrated that Dianamon and the Mirei quests are also not available on some copies of the PlayStation 4 version, though the voice issue has still only been documented on the Vita. February 2nd, 2016. 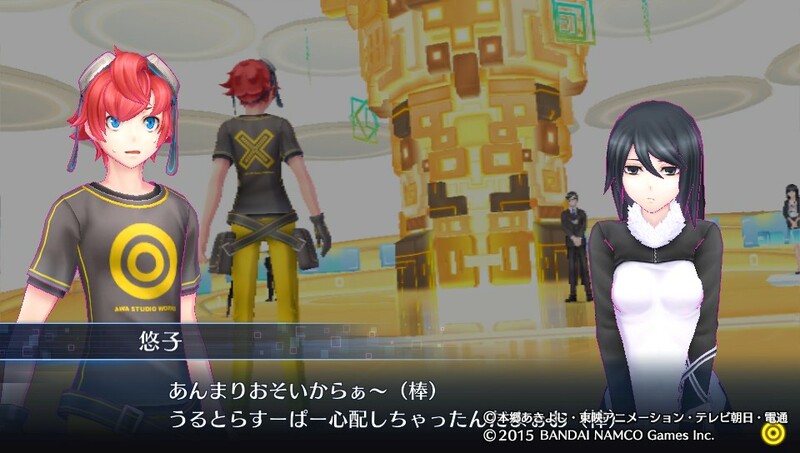 Several hours after the North American launch of Digimon Story Cyber Sleuth, it has become apparent that many minor and major scenes that originally had a voice track in the Japanese edition of Cyber Sleuth have had those tracks removed in the Vita version of its English localization. An exact count is hard to pin down at this time, but one scene that stands out is when the player meets with Yuuko in chapter 4; during this sequence Yuuko tries to act like a "normal high school girl," leading to her voice actor Itou Kanae putting on a stellar performance pretending to be a bad actor. ("You're *so* late... I got *ultra-super* worried.") Other scenes with removed dialogue include a confrontation with a major boss in chapter 6, and the player’s formal introduction to police detective Date Makiko. The removed voiced sequences are still present in the PlayStation 4 version of the game, as are several purple downloadable quests not available in the Vita game. These quests were available in the Japanese edition of Cyber Sleuth, which was exclusively on the Vita. The localization has been far from perfect, with punctuation errors abounding in the script, from missing periods to uses of "it's" instead of "its." There are also several questionable translation choices, like choosing to call one of the core dungeons of the game "Kowloon" instead of the more accepted "Coulomb" or "Cron." (All three are written クーロン Kuuron in Japanese, and the area is officially written in English as "Cool-wrong" in one area of the Japanese game, which phonetically approximates how the name is said aloud.) The localization translates the Garakuta (Junk) Park as "Galacta Park," yet retains a dialogue in which an NPC says that the park is made of junk, resulting in the character claiming the park to be "made of Galacta." At another point, Shiramine Nokia says "Looks like he's not here" rather than "they're" while looking for two Digimon. As a whole the text appears not to have been proofread. Jarringly, Detective Matayoshi still refers to Kuremi Kyoko as "Kyo-chan" in the English script; thus far no other honorifics have been found to be used. Very unfortunate for Vita players. I hope Namco will patch it. Generally, how do you feel about the translation quality aside from typos? Like in terms of prose or flow? And do they try to retain the characteristics of the original speech patterns? It's certainly accurate, but it feels very rushed overall. Like this was a script they needed to be writing *as* the JPN script was being written, and that just wasn't a luxury their staff had to work with. Nokia isn't as "modern" as she was in Japanese (she was more or less a human Twitter account in the original) and Kyoko isn't as eloquent. The JPN script also loved to use nonstandard characters (hearts, music notes, etc) in speech, which are absent here. If you're accustomed to extremely detailed translations from people like...Iunno, maybe Alexander O. Smith, you're definitely not going to be impressed. It's functional but flawed. This is translation on a small budget. btw do you know why they remove it Touya? is there any reason behind it? 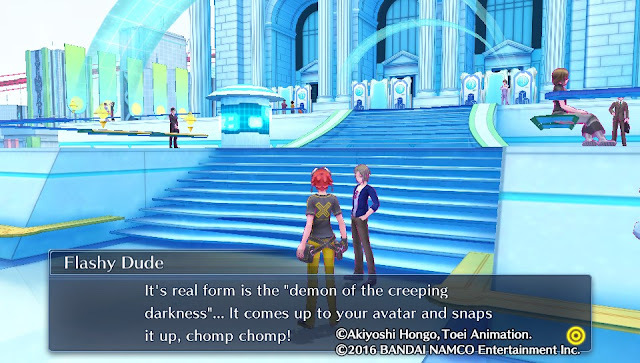 http://www.gamefaqs.com/boards/757436-digimon-story-cyber-sleuth/73238694 also maybe good to read this OP's post. I suspect they only started translating it when they announced the game would be coming over back in July. They were probably working on it for 6-7 months rather than a full year. I smelled this crap a mile away happening. I was both happy and skeptical that Bandai Namco was gonna rush it out the door for Vita users, but not for PS4 users. I really don't mind, cause I am gonna buy the PS Vita version to support the IP anyway. Thanks for this post! I mean it's Namco. You expect them to be competent? After SAO: HF and Hearts R I wouldn't think so. And especially with the porting, jeez. ToSC PC port has some major problems. They can't do anything right. I guess the Kowloon thing, they re-use the Sunburst/Moonlight'S Kowloon Co. Cute scene with Iron Kanae being removed? I hope this is just a bug waiting to be patched. Thanks for sharing these Vita butchery info and these YouTube vids of the PS4 counterpart, at least I can enjoy the missing voices that way. It's localized in English only and there's no physical version on Vita. Besides, the game is only 1.5 GB in the first place. Anyway, it's very likely a bug, but it'll probably take at least two weeks for Namco to patch it. I'm very disappointed with Bandai...But I think they'll patch it this week. Btw, I'm going to buy the Vita version in Europe, so I expect it'll be fixed by then. I hope it will be fixed because I see no reason to take out scenes like that. This wasn't an issue of offending people's sensibilities by showing too much of a character's skin. So, I got to the part where Yuuko tries to act like a normal high school girl, but the voice was playing just fine. I'm playing an european digital version on Vita. I recorded a bit of the scene, but the rest of it (before and after) also had voice. On my North American digital copy, none of the voices played from the moment Yuuko walked on-screen until I got to the end of the dungeon. I've talked to other NA players that also reported voices being absent for most of that chapter. I guess it was somehow fixed for the EU version then. Let's hope they also fix it in the American version. I just confirmed on physical R3 Asia release, the voice are there, so I think the R3 version is a direct translate from R2 JP version.